The threshold garage seal is an excellent choice to help you maintain your garage. 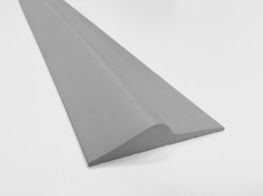 This grey rubber garage threshold seal will not disappoint, and will work well with your garage door. Keep out those unwanted pests, draughts, and leaves with this excellent garage door seal. (Available in other colours and sizes.) 15mm Grey Rubber Garage Threshold Seal. This product helps stop any water ingress, as well as problems with leaves and dust or draughts blowing under your garage door.